focus on species in greatest need of management attention that are indicative of the diversity and health of the State’s wildlife and habitats. The 2006 Oregon Conservation Strategy and Nearshore Strategy documents each contained a separate list of Strategy Species to focus management and conservation needs in accordance with the guidelines of the State Wildlife Grants program. In this revision, these two lists are merged into one that is included in the Oregon Conservation Strategy. The updated Nearshore Strategy also includes a copy of the nearshore Strategy Species list, with the subset of species relevant just to the nearshore. This chapter describes the process and criteria ODFW Marine Program used in developing the list of nearshore Strategy Species, and provides information about those species. The State Wildlife Grant elements helped guide the ODFW Marine Program in developing a method to identify key nearshore species whose conservation needs are of the greatest interest to managers. Strategy Species are those species of the greatest concern and which meet the State Wildlife Grants Program requirements for State Wildlife Action Plans. Additionally, the Oregon Nearshore Strategy designates Watch List Species (those that do not meet the Strategy Species criteria, but which may in the future when sufficient data is available to make that determination), and Commonly Associated Species, (including common nearshore species whose conservation needs can best be met through habitat management or through management of communities of organisms). Species information was used in conjunction with information about the habitats, factors and stressors affecting species and habitats, conservation research and monitoring needs, and public input to formulate overall recommendations. Nearshore Strategy Species – Species determined to have conservation needs in greatest need of management attention and to have the greatest potential for benefit from management actions. Strategy Species provide a focus for planning and prioritizing specific conservation, management, and research actions by ODFW and other partners. Nearshore Watch List Species – Identified as important nearshore species that do not require immediate management action, but may in the future. Managers should be aware of conservation needs and potential factors affecting these species and that sufficient data for these species may be lacking. Nearshore Commonly Associated Species – Species identified to be important to nearshore environments, whose conservation needs can best be met through management affecting habitats or communities of organisms. Nearshore Strategy Species species were determined by ODFW to be in greatest need of management attention. Identification as a nearshore Strategy Species does not necessarily mean the species is in trouble. Rather, those identified as Strategy Species have some significant nearshore management and/or conservation issue connected to that species that is of interest to resource managers. Development of the 2015 Strategy Species list began with a review of the original list of Strategy Species developed a decade ago, including species that utilize the nearshore but that had only been included in the Oregon Conservation Strategy. The species that were still recognized as species of concern, at risk, important, or a priority by federal or state agencies, stakeholders, experts, non-government organizations, scientific researchers, tribes or other conservation processes were included on the revised list. In addition, a comprehensive list of species that occur in the nearshore was evaluated for potential new additions to the Strategy Species list. To maintain a nearshore ecosystem focus, attention was focused on both harvested and non-harvested species that predominantly occur, or are common, within Oregon’s nearshore environment. population status information, including whether a population assessment has been conducted, listed as overharvested, listed as a threatened or endangered species, whether species has experienced a population decline, whether the species is rare, has small range or is endemic, if species has specialized habitat requirements, and if the species has low productivity. 1) Species status – examples of species status include overharvested, rare, declining population throughout its range or in Oregon. 2) Ecological importance – examples of ecological importance include habitat forming, habitat engineer, keystone species, prey species. 3) Vulnerability to human or natural factors – examples of vulnerability include susceptible to oil spills or water pollution, life history traits that render it particularly vulnerable (low productivity, specialized habitat requirements, climate change or ocean acidification effects, etc. ), or there are significant data gaps or research needs on vulnerability for that species. 4) Economic/social/cultural importance – examples of importance to humans include commercially important, recreationally important, culturally important to Oregon tribes, flagship or sentinel species. Those species whose conservation needs were determined to best be met through existing management affecting habitats or communities of organisms were separated from the list. Through extensive examination, deliberation, and consultation with subject matter experts, 74 species were identified as nearshore Strategy Species. These species, or distinct populations, were determined to have conservation needs in greatest need of management attention and to have the greatest potential for benefit from management actions. Changes to the nearshore Strategy Species list include: one marine mammal was removed and three species of fishes were moved to the nearshore Watch List; 15 Strategy Species, six anadromous fishes and ten birds, identified in the Oregon Conservation Strategy that utilize nearshore habitats were included; and nine new species were added. The nine new Strategy Species added include: three fishes, one of which is a newly discovered species; four invertebrates; one marine mammal; and one plant. Table 5.1 presents the list of all 74 nearshore Strategy Species, including notes on special needs, limiting factors, data gaps and conservation actions for each species. This information is provided for use by managers, research and monitoring projects or programs, those producing education and outreach materials, planners, and the general public. Readers should note that the management jurisdiction varies for each species. For instance, some nearshore Strategy Species are managed by ODFW, others by NOAA Fisheries or USFWS, and many species are under shared management authority by multiple resource agencies and institutions. Table 5.1. List of Nearshore Strategy Species. Click the links in the table below for more information on each species. Photo Credit: Bird Research Northwest. Brandt’s cormorant is a Watch List species. 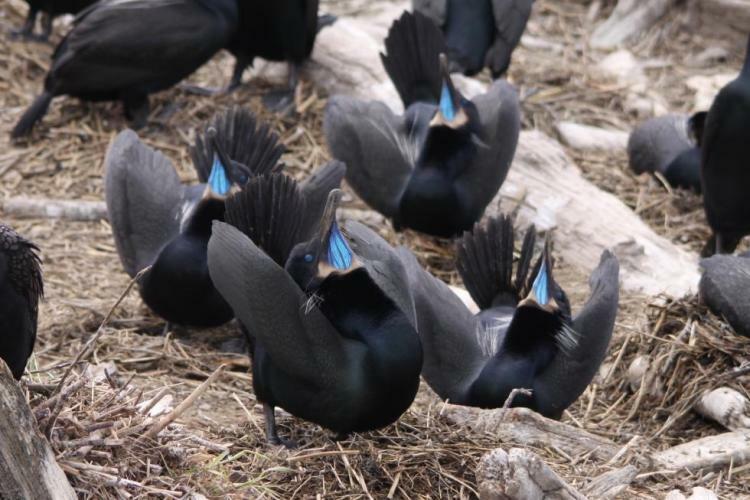 They nest on islands and rocky headlands along the Oregon coast and forage in Nearshore waters. ODFW identified a handful of species from the comprehensive species list to be placed on a Watch List. Watch List Species (Table 5.2) were determined to be important nearshore species that do not require immediate management action, but may in the future. Managers should be aware of conservation needs and potential factors that could affect these species and consider them for future nearshore Strategy Species status if sufficient data can be gathered to support the change. Examples of future information that may warrant status change include a change in harvest status, or the occurrence of an anthropogenic or natural event (water pollution, climatic event, etc.). Utilizes rocky cliffs and islands for nesting. Forages in nearshore habitats. Sensitive to environmental change. Localized population fluctuations. Nests in burrows on offshore islands with no mammalian predators. Vulnerable to nesting area disturbance, predation, oil spills and environmental change. Nests in colonies on offshore islands and coastal cliffs with no or minimal mammalian predators. Vulnerable to nesting area disturbance, predation, oil spills and environmental change. About 66% of the population from British Columbia to California nest in Oregon. Utilizes rocky cliffs and islands for nesting. Forages in nearshore habitats. Sensitive to environmental change. Population potentially declining, data inadequate. Vulnerable to ground predators, oil spills and environmental change. Breeding attempts may fail during climatic shifts (e.g., climate change). Highly dependent on specific nearshore feeding areas during migration. Susceptible to coastal habitat disturbance, degradation and destruction. Current population size unknown. Populations highly variable among years. Potential for long term declines. (Cerohinca monocerata) Nests in burrows on offshore islands. Forages in nearshore waters while nesting. Prefers nesting sites on cliffs and elevated areas to aid in take-off. Sensitive to nesting disturbance and oil spills. Low to moderate productivity. Commercial harvest. Periodic recruitment dependent on favorable oceanic conditions. OR northern extent of range. Global concern regarding shark harvest and management. Low productivity. Lack of scientific knowledge. Low productivity. Northern stock population abundance unknown. Recreational harvest. May be getting reported as Red Irish lord. Little known about abundance. Recreational harvest. Little known about abundance. Commercial and recreational harvest. Population status unknown. Certain years found and caught on OR’s south coast. Population status unknown. Late maturation, longevity, and low productivity. Inadequate population status information. Commercial harvest. Population status unknown. Sport and commercial harvest. Formal stock assessment has been conducted. Concerns that they’re being caught and reported/confused with Monkeyface pricklebacks. Inadequate population status information. Low productivity with periodic recruitment dependent on favorable oceanic conditions. Inadequate population status information. Global concern regarding shark harvest and management. Low productivity. Lack of scientific knowledge. Collected for public aquarium display. Concerns regarding potential of increased harvest in OR (actively harvested in CA). Forage fish. Population status unknown and life history information limited. Forage fish known to have large population fluctuations thought to be linked to environmental change, but mechanisms not understood. Target of commercial fisheries. Recreational catch. Little known about abundance. Minor commercial and recreational harvest. Collected for public aquarium display. Population status unknown. (Isurus oxyrinchus) Global concern regarding shark harvest and management. Low productivity. Lack of scientific knowledge. Global concern regarding shark harvest and management. Low productivity. Lack of scientific knowledge regarding movements, spawning season, spawning grounds, and fecundity of females, population abundance. Important commercial and recreational species. Subtidal broodstock unknown. Limited information on essential habitat. (Parastichopus californicus) May be important agents of bioturbation; during feeding and reworking of surface sediments, they can alter the structure of soft-bottom benthic communities. Population status in Oregon unknown. Target of commercial fishery in CA. Important prey. Used in medical research. Commercial and recreational harvest. Potential for extended planktonic larval duration up to 4.5 years. Commercial harvest of all snails prohibited. Oregon state seashell. Potential for harvest concerns. Not actively managed (though has regulations in place). Population status and trend information lacking. Documented sporadic occurrences along the OR coast thought to be strays from WA rather than established OR population. Population status in OR unknown. Some species which did not meet criteria to be included in the nearshore Strategy Species or nearshore Watch Lists were identified to be important to nearshore ecosystems. These species were included on the list of commonly associated species (Appendix F). The conservation needs of these species will most likely be met through habitat management or management of communities of organisms.